On Dec. 12, John Morton, the director of Immigration Control and Enforcement (ICE), which operates under the auspices of the Department of Homeland Security, announced that the long-controversial 287(g) program is ending. The designation 287(g) refers to a section of the Immigration and Nationality Act that authorizes ICE to enter into agreements with local law enforcement agencies (called a Memorandum of Agreement, or MOA) to deputize local police officers to act as immigration agents in their daily work. For example, operating under a 287(g) agreement, a county police officer could question and detain a person based on their immigration status. In many places, this program has led to increases in racial profiling, as local police officers increasingly stop anyone who looks or speaks like an “immigrant” for arbitrary reasons. In particular, Maricopa County, Ariz., under the jurisdiction of the notorious Sheriff Joe Arpaio, has been well documented for serious allegations of abuse under the 287(g) program. Secure Communities (also known as S-Comm) is a national biometric fingerprint database that is used to check the immigration status of anyone who is booked into jail. Anyone who is suspected of being an undocumented immigrant has a detainer (or ICE hold) placed on their case. ICE interviews the detainee either in jail or after they are released. If ICE deems it necessary, they are then taken into custody, and deportation proceedings are initiated. When it was initially introduced in 2008 under the Bush administration, S-Comm was piloted in 14 jurisdictions nationwide. As of May 2011, the program had expanded to include over 1210 jurisdictions under the auspices of the Obama administration. The DHS has vowed to implement the program nationwide by 2013. S-Comm is only the latest step in the Obama administration’s new and supposedly “softer” immigration enforcement strategy, which so far has resulted in record highs of 392,000 deportations in 2010 and 396,000 deportations in 2011. However, the implementation and expansion of Secure Communities has become increasingly controversial and divisive. When S-Comm was originally introduced, its stated goals (taken from a 2009 report to Congress) included the major goal of deporting dangerous criminals. Nevertheless, ICE’s own statistics show that the vast majority of immigrants deported under this program have committed either no crime at all, or have only a low-level offense (such as a misdemeanor) on their record. For example, between 2009 and the first five months of 2011 between 83%-85% of ICE detainees apprehended thorough S-Comm had lower-level (or no) offenses; in the first five months of 2011, 32% of those arrested were non-criminal. The fact that these statistics are so high points to an even greater increase in racial profiling in jurisdictions where S-Comm is put in practice. Every day, police officers in communities across the country are pulling immigrants over for arbitrary reasons like having a broken taillight, or a rosary hanging from their rear view mirror. There have even been reports of people accused of a false crime and later released who have been deported under the Secure Communities program. Police officers know that any immigrants they book in the jail will have their fingerprints run through the Secure Communities database, and they will be handed over to ICE. Essentially, then, there is no longer a reason to deputize local police officers to act as immigration agents under the 287(g) program. S-Comm does all the work for them. During the initial phase of expansion under the Obama administration, participation in Secure Communities was seemingly offered to counties on an optional basis. However, because of the failure of the program to meet ICE’s own stated goals of deporting “dangerous criminals,” and reports of dwindling trust of police officers in immigrant communities where S-Comm was being implemented, more and more counties began to attempt to opt out of participating in Secure Communities. First came Arlington, Va., then three counties in California—Santa Clara, San Mateo, and San Francisco. After seeing this first wave of resistance, ICE backtracked and said that counties could no longer opt out of the program. Following this announcement, states began to withdraw from participation. In 2011, the states of Illinois, New York, and Massachusetts, along with Washington, D.C., and the municipalities of Los Angeles, San Francisco, and Boston all attempted to withdraw from the program, without success. After resistance to participation in Secure Communities continued to grow, ICE changed its stance once again, stating in August of 2011 that it was voiding all of its MOAs with local jurisdictions. In practice, ICE could now implement the program wherever and whenever it chose, despite growing resistance from police, local and state governments, and community activists. And it began to do just that. In response to all of this controversy and lack of clarity, the National Day Laborer’s Organizing Network (NDLON), the Center for Constitutional Rights (CCR), and the Immigration Justice Clinic of the Benjamin N. Cardozo School of Law joined forces to file a massive request under the Freedom of Information Act to release federal documents surrounding the highly secretive Secure Communities program. As a result of this request, over 15,000 documents relating to S-Comm were released to the public in February 2011. Essentially, then, Secure Communities is the testing ground for government programs that will soon be used to collect information on all people living within the United States, regardless of citizenship status. More information regarding the Secure Communities FOIA documents can be found at: http://www.uncoverthetruth.org. As the Secure Communities program has quickly expanded to new areas, without any kind of public notification or debate, so has resistance. The Minnesota Immigrant Rights Action Committee (MIRAc), along with a coalition of local labor, religious, and community organizations, has been fighting for over a year to keep S-Comm out of the state. However, despite the prior existence of separation ordinances in St. Paul and Minneapolis (the two largest cities in Minnesota), ICE implemented the Secure Communities program statewide on Feb. 7, 2012. In Connecticut, an immigration law clinic at Yale has filed a federal class-action lawsuit to challenge the use of detainers by ICE, and immigrant advocates have delivered a petition urging state officials to delay implementation of Secure Communities in their state. As the FBI and ICE continue to work together to expand the web of Secure Communities and other biometric data-sharing programs across the United States, it is clear that we all must begin to resist, or face the increasingly frightening consequences. 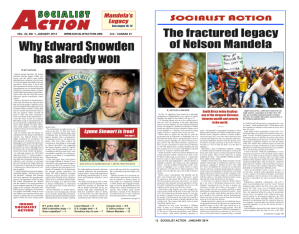 > The article above was written by Lisa Luinenburg, and first appeared in the March 2012 print edition of Socialist Action newspaper.